THIS may seem an odd moment to make the claim, but Britain is a country in the grip of a modernising frenzy. The outside world may see an unvarying kingdom of royal weddings, golden carriages and clip-clopping Horse Guards, with a young prime minister drawn from the old Establishment. But strip away the pageantry, and David Cameron’s Conservative-Liberal Democrat coalition is proposing radical changes to the constitutional order. A national referendum on May 5th and months of parliamentary wrangling lie ahead. But if all the changes being proposed by the coalition come to fruition, British democracy could look and feel very different by the next general election, set by the coalition for May 2015. Depending on the outcome of the referendum, that general election may be held using a new voting system: supporters of change call it the biggest shake-up since votes for women in 1928. Voters are to be asked to choose between keeping the winner-takes-all system of first-past-the-post (FPTP) and moving to the alternative-vote (AV) method, in which voters rank candidates in numbered order of preference. Under AV, if no candidate wins more than 50% of voters’ first preferences, the least popular candidate is eliminated and the second preferences of those who voted for him are distributed. The process continues, redistributing third, fourth or lower preferences until someone crosses the 50% line. The House of Commons is also set to shrink from 650 to 600 seats, and almost every constituency will have new boundaries. With few exceptions, the seats will be more uniform, with around 76,000 voters apiece—a change that will mean many seats straddling county borders for the first time, and the merger of many small seats, notably in Wales. The next parliament might also have a fixed term of five years, ending the privilege enjoyed by British prime ministers of choosing the date (within five years) to call a general election. Under another set of proposals due to be unveiled in May, the present House of Lords is earmarked for abolition. Its 792 serving members are to be replaced, after a transition period, by a semi-elected house (possibly called a Senate) of as few as 300 members. According to press leaks, 80% of its members would be elected by a form of proportional representation (PR)—ie, a system in which a party that polls a fifth of the votes wins roughly a fifth of the seats—for single terms of 15 years. The remaining 20% would be appointed, in an awkward trade-off between democracy and the expertise brought to Lords debates by retired military chiefs, judges, scientists and other grandees who may be unwilling to run for party-political office. The 92 remaining hereditary peers would be ejected from Parliament, as would most (but not all) of the 25 Anglican bishops and archbishops who sit in today’s House of Lords. Many peers expect their elected successors to be much more assertive towards the House of Commons, straining old conventions that the Lords should bow before the primacy of the elected chamber. Government ministers play down the prospect of clashes, saying there is no reason why the relationship should alter. That seems a stretch. At the least the new relationship will probably have to be written down in statutory form. And then, notes Vernon Bogdanor of King’s College London, Britain would be “halfway to a written constitution”. That marks another break, this time with the tradition that Britain’s constitution exists merely in virtual form, scattered across the statute books and buttressed by precedent and convention. Will all these changes happen? Previous attempts at bold reform have often been watered down. Ordinary voters may determine part of the answer. Plans for reforming the upper house are—like plans for AV—Liberal Democrat ambitions, and are the personal responsibility of Nick Clegg, the Lib Dem leader and deputy prime minister. If May 5th sees a series of defeats for the Lib Dems—notably in the AV referendum, but also in elections held the same day to local councils and devolved parliaments—Mr Clegg will need something to cheer up his party. If, on the other hand, AV is approved, furious Tory MPs may demand that the House of Lords be left alone. Even pro-reform politicians admit that many knotty issues would have to be resolved before a Senate could rise from the ashes of the House of Lords. If some members are appointed, will they have less legitimacy than elected colleagues? If a few Anglican bishops are allowed to stay, what about leaders of other faiths? And will today’s peers vote for their own eviction? The 2010 coalition agreement talks of “grandfathering” to allow current peers to remain for some time. The terms of that transition will be considered by a joint committee drawn from both houses of parliament, but “most change is evolutionary in this country”, says the minister soothingly. Senior peers talk of proposals for giving ejected members a soft landing. One proposal would offer retired peers associate membership, including the right to return and visit the House of Lords for tea. With so many economic headaches, it may seem puzzling to find the government so focused on constitutional change. Part of the explanation lies in unfinished business. The years of Labour rule, from 1997 until 2010, were a time of frequent (and frequently rushed) alterations to the ancient, patched fabric of Britain’s constitution. Scotland, Wales and Northern Ireland were given their own devolved governments and parliamentary assemblies, with (depending on the region) more or less sweeping powers over everything from schools and health care to transport, housing and policing. The ancient office of Lord Chancellor—formerly the head of the judiciary, presiding officer of the House of Lords and a cabinet minister all at once—was broken into three. 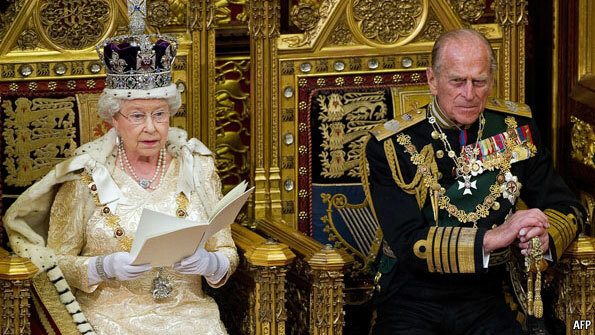 A Supreme Court of the United Kingdom was established and hundreds of hereditary peers kicked out of the Lords. London gained a directly elected mayor, as did a clutch of other local authorities and boroughs. Forms of PR were introduced for elections to the European Parliament, the new devolved regional assemblies, the Greater London Assembly and for the direct election of those mayors. But several democratic flaws were left unfixed. Political leaders say they are responding to public demands to mend a system that is “broken”. They are right that trust in politicians has collapsed, notably after a string of revelations about MPs and peers caught fiddling their expenses in the last parliament (leading to prison for some). Fully 40% of voters told the latest British Social Attitudes survey that they “almost never” trust any government to put the national interest first. But alas, several of the constitutional fixes on offer are designed to serve the interests of those in power. The May 5th vote on electoral rules will be Britain’s first national referendum since 1975 (on joining Europe). Outside the Westminster village, few voters would have chosen arcane electoral reform as the subject for such a poll. A survey conducted on April 15th-17th by ICM, a pollster, found only 50% promising to vote (dropping to 44% in areas like London, where there are no other elections on May 5th). Campaigners expect actual turnout to be still lower. Among the professional political classes, constitutional activism has been spurred by a growing sense that FPTP is unfair. As an electoral system, it offers ideological clarity and accountability, but it is not very representative, giving nothing to losers even with substantial support. This failing was less grating when only two parties contested most seats. In 1951 almost 97% of those voting supported Labour or the Conservatives; in 2010 only 65% did (see chart 1). In parallel, the splintering of the vote has led to a sharp rise in the number of MPs elected by a minority of votes cast in their seat: from a few dozen a half century ago to 433 out of 650 MPs last year. At the 2010 election in Norwich South—a three-way marginal where the Greens polled well in fourth place—the Lib Dems won with just 29.4% of the vote. It is commonly said that the current system is tough on smaller parties like the Lib Dems, but that is not quite right: some very small, ultra-regional parties thrive on it, for instance in Northern Ireland. But FPTP is brutal to parties with diffuse geographical support. The Tories in Scotland won about one in six votes at the last general election, but got just one of 59 Scottish seats at Westminster. It is the same for Labour in southern England; it polled lots of home counties votes but holds just ten of 197 seats outside London. FPTP hurts the Lib Dems and smaller parties—such as the Greens or the extreme-right British National Party—all over the country. Yet politicians are quite capable of ignoring even glaringly unfinished business if it suits them. The key explanation for the current frenzy of political reform is the existence of Britain’s first full coalition government since the second world war. The Lib Dems have long hated FPTP. In the 2010 general election, one Lib Dem MP was elected for every 120,000 Lib Dem votes, one Tory MP for every 35,000 Conservative votes and one Labour MP for every 33,400 votes for that party. The Lib Dems really want a form of PR. Under PR, most parliaments would probably be hung, and Lib Dems could dream of playing a pivotal role in endless coalitions. For their part, the Tories have traditionally disliked the idea of PR and indeed coalition government, but have also resented the pro-Labour bias in the current system of voting at general elections. 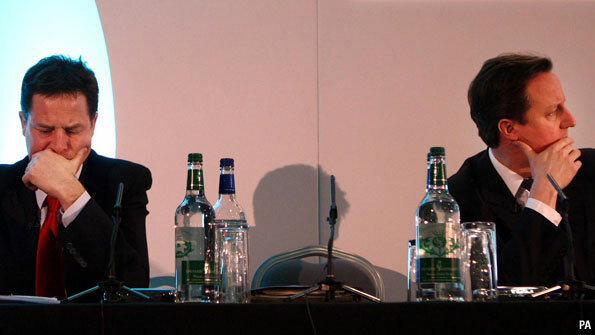 Studies led by Ron Johnston of Bristol University show that if Labour and the Conservatives had won identical shares of the national vote in the last four general elections (and abstentions and other votes had remained unchanged), Labour would still have romped home with scores more seats than the Tories: in 2010 the “bias” was 54 seats. Conservatives tend to ascribe this bias almost wholly to the fact that Labour-held seats usually contain fewer registered voters than Tory ones. Between boundary reviews, that gap tends to grow inexorably, due to long-term population shifts away from (Labour-leaning) inner cities to (Tory-leaning) suburbs. This explains why Tories typically push for frequent reviews of constituency boundaries, and Labour resists. In fact, constituency size is only one factor favouring Labour. More important is that Conservative seats are often super-safe, with many more Tories turning out to vote than are needed to secure victory: Labour votes tend to be spread about more efficiently. Still, the Tory desire for new constituency boundaries and the Lib Dem hatred of FPTP gave the parties the basis for a deal, agreed during five days of coalition negotiations in May 2010. The Lib Dems would support the redrawing of constituency boundaries (and fixed-term parliaments, another longstanding goal). The Conservatives would support a national referendum on whether to move to AV. Killing off FPTP quickly became a totemic goal for many rank-and-file Lib Dems, who are not enjoying coalition with the Tories. Few Lib Dems are great fans of AV, a system that Mr Clegg once called a “miserable little compromise” before accepting it as a “baby step” towards PR. The Tories have their prize already: a plan to redraw constituencies has passed into law, and boundary commissioners have been told to complete their work by October 2013. Critics of the whole process (notably MPs likely to lose safe seats) predict a future of “homogenised” constituencies ignoring historic community boundaries, weakening the bonds between MPs and voters. Enthusiasts say today’s disparities are simply anti-democratic: the average English constituency contains nearly 72,000 voters, whereas the average Welsh seat holds 56,500, and Scottish and Northern Irish ones lie somewhere in between. The referendum on whether to adopt AV has strained the coalition between the Conservatives and their Lib Dem partners as never before (the Labour Party is divided on the issue). Though the fight is presented in terms of democratic high principle, venom has been introduced because naked interests are at stake. The ideological meeting of minds between Mr Cameron and Mr Clegg—a liberal conservative working with a conservative liberal, in the happy phrase-making of Downing Street insiders—has been chilled by the realisation that the AV fight is a zero-sum game for the pair. A No vote would leave Mr Clegg having to explain to his party just what they gain from coalition with the Tories. Meanwhile, many Conservatives fear that a Yes vote might bar their party from ever winning a working majority again. Many of the mud-slinging claims of both camps, though, fall apart under scrutiny. Modelling data from previous elections, the New Economics Foundation, a think-tank, suggests that AV would merely trim the number of safe seats, so that 16% rather than 13% would change hands at a typical election. For all the Yes camp’s talk of fairness, the 1998 Jenkins commission on electoral reform concluded that, in a landslide election, AV exaggerates the swing to the winning party: in 1997, Labour would have won 452 seats rather than 419. Nor would AV eliminate tactical voting. AV allows supporters of small or fringe parties to cast a first-preference vote for their favoured candidate, confident that their second preference will probably be in play and hence a matter for tactics. That does not mean fringe parties are easily elected under AV, as some No campaigners claim. Extremists are unlikely to pick up enough lower-order preferences from other rivals to get over the 50% line. But AV can result in large hauls of first-preference votes for minor parties. One plausible effect of moving to AV in Britain would be hefty first-preference votes for small parties such as the anti-European United Kingdom Independence Party, but without a corresponding haul of Westminster seats. Demands to move from AV to a full PR system would surely follow. Other countries, however, use AV without ill effect. By holding primaries in which one candidate has to win over half the vote to avoid a second round, many states in America operate a variant of AV. France also has a two-round system designed to ensure that the ultimate winner has the backing of a majority of the voters. Australia, Papua New Guinea and Fiji use AV in parliamentary elections, and Ireland uses it to elect its president. In Australia the voting system is utterly uncontroversial. During the 93 years that AV has been in use (for the lower house, and for state elections; the Senate is elected by proportional representation), it has produced conservative governments for about two-thirds of the time, Labour governments for one-third; hung parliaments, though Australia has one at the moment, are unusual. The system is widely popular. It is not, however, a form of proportional representation, and can sometimes be less proportional than the current system. It does nothing to fix the problem of a divided Britain, in which FPTP leaves the left artificially dominant in Scotland and Wales, and the Conservatives unduly dominant in England. Most damagingly to supporters of AV—for it undermines their core argument—it would not even stop MPs being elected by a minority of votes cast. The version of AV used in Australian federal elections obliges voters to rank all candidates in order. The version on offer in Britain would allow voters to give their favourite candidate a “1” and stop there, behaviour known to psephologists as “plumping”. Where plumping is allowed (eg, in some Australian state elections), most voters do it, turning AV into a messy version of FPTP. Even where plumping is not allowed, candidates who start with the largest haul of first-preference votes usually win. Just as important, FPTP is a winner-takes-all system, emphasising the clash of competing ideas as parties seek to become the most successful on the ballot. Under AV, candidates must seek instead to secure the broadest possible support. At a Yes campaign event in Dorset on April 11th, speakers vowed that divisive policies like Thatcher-era privatisations or the invasion of Iraq could never happen under AV. In short, the voting system chosen on May 5th will dictate the nature of British democracy. No great public tumult of ideas called this moment of change into being. Rather, the spark came from the accidental radicalism of the British electorate who were ready to be rid of one big party, Labour, at the last election, but not ready to entrust majority rule to another, the Conservatives. In their indecision and anger at politics as usual, voters called into life something alien and unexpected: a British coalition government, with a confused, only half-understood mandate to fix the political system. The British are now living through the next step of that revolution-by-accident. They will be living with the constitutional consequences for many years to come. The AV referendum: Did David Cameron intend to win a landslide in the AV debate? Scotland: Scotland: voting to escape austerity, not the United Kingdom? Germany and Libya: Return of the Afrika (aid) Korps? Is it right to celebrate the death of Osama bin Laden? Social notworking: Where do workers get the most days off? Angst in the United States: What's wrong with America's economy? China's census: Older and wiser?